What Has Been the Impact of Greater European Integration on British Government &amp; Politics? The Unification of Europe. What Has Been the Impact of Greater European Integration on British Government & Politics? The Unification of Europe Although Britain's involvement in what is now known as the European Union did not begin until a relatively long way into its existence, I feel that for reasons of context that its history is noteworthy. The origins of the concept of a unified Europe became prominent in the post-war period of the late 40's and into the 50's. Many would, somewhat ironically, place the onus on Winston Churchill who suggested the creation of a "United States of Europe" to deal with the issues that many struggled to contend with after the decimation of wide areas of Europe. However, the idea of unity within Europe was conceived of not just to create a climate in which peace could be prominent, but also to deal with the economic difficulties that much of Europe faced. War had not only destroyed many physical aspects of the European states, the semblance of economical stability that some parts had enjoyed had also been obliterated. Those that had been in difficulty during the inter-war period suffered this realism further. It was primarily for these economic factors that formal bodies were formed, with the first, the Benelux Customs Union, coming into effect in 1948. ...read more. Both parties seem to have done a u-turn on their previous policies, with New Tory/Labour (delete as applicable) broadly speaking in favour of Europe, with some dissention in the ranks, and following their recent trend, we see a polarised Conservative party struggling to find itself. 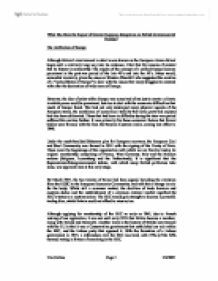 The Institutions of the EU The EU comprises numerous institutions, which fall under the two broad categories of Intergovernmental and Supranational. Accountability is a major concern for the EU, as many bodies it may be argued, have a 'Democratic Deficit', that is, a lack of accountability. There are many examples of unelected bureaucrats, similar to those that sit on Britain's many quasi-autonomous non-governmental organisations, holding decision-making power. With regards to the implementation of ideas within the European infrastructure, there are many bodies that deal with this area. The Council of Ministers (an intergovernmental body) is the decision making body of the EU, with the power to approve or dismiss proposals, but also the power to issue regulations, directives, recommendations and resolutions. The Council is in reality as series of councils, each dealing with matters appropriate to its members. The members are directly elected MP'S in their own countries, for example Jack Straw is Foreign Minister for Britain and sits on the Council of Foreign Ministers, and so is accountable. ...read more. However, British insistence led to the phrase "ever closer union" being substituted for "federalism". Although Britain is the main protagonist in the fight against federalism many other European nations have shown great scepticism, as highlighted by the Amsterdam Treaty. Subsidiarity is the policy that both the Supranationalists and the Intergovernmentalists believe will be their saving grace. This is the idea that all decisions should be taken at the level most appropriate to their sphere of influence, that is, at the lowest appropriate level. The Committee of the Regions is the body that oversees this principle. The reason that this principle is so popular is that both contrary schools of EU thought believe that it will serve their purpose, which to some extent it will. The Supranationalists are happy, as they believe it will encourage greater interdependence, and the Intergovernmentalists believe it will stop there greatest fear, a Federal European Superstate, ever coming into existence. Another prominent issue is the perceived loss of sovereignty that membership of the union entails. It is true that British law is now subordinate to EU law, a fact made painfully obvious to the government with the Factortame case and many more like it since. This case highlighted not only that the ECJ can at any time overrule UK statutes, but also that we have lost control over a plethora of domestic issues, encompassing many economic and social factors. Tim Collins Page 1 5/2/2007 ...read more. Britain would keep the EEC friendly towards America, meaning it was not as likely the EEC would become a 'Third Force' in the World and turn away from NATO. new regime to provide incentives for European states in order to collectively assure their security (on their own) have mainly failed9. Formulations without U.S. existence, that will also disable it's commitments to remain engaged in European affairs, reach out to Central Europe and be able to be part of shaping Russia's future, could not hold onto reality. Why did the witch-craze happen in Early Modern Europe? than it does for Britain. As in Britain, opposition to the euro in Sweden reflects discomfort with the broader thrust of European political integration as much as, or more than, it expresses doubts about the single currency itself. Many Swedes worry that deeper integration will eventually threaten the Swedish welfare state. Has Europe become a federal superstate? The free movement of people within different members of the EU is another sign of federalism, as the very concept or notion of the nation state and borders is decreased. For the purposes of international recognition and definitional basis, one is considered European in terms of legislation. The EIB has legal personality and is financially independent. Its members are the Member States of the Union, and it has its headquarters in Luxembourg. In 1997, it granted loans totalling 26.2 billion, by confirming its position as a leading international financial institution. The priority objective of the EIB is to contribute to the balanced development of the Union. 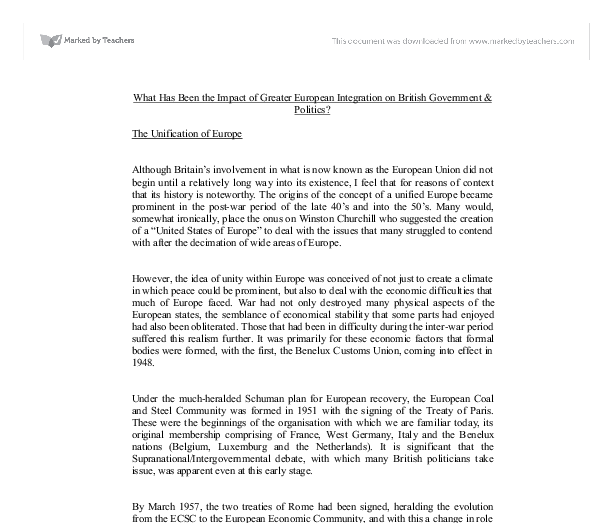 However Dell explains how America initially expected the stable government of Britain to take the leading role in the integration of Europe after 1945 but when it became apparent that this would not happen, they then looked to France to be the main instigator. Amongst all the western unity, the US remained a heavy presence in Europe, and, at th advent of the Korean war, placed great pressure on West Germany to re-arm and become signatory to NATO, much to the distaste of France.